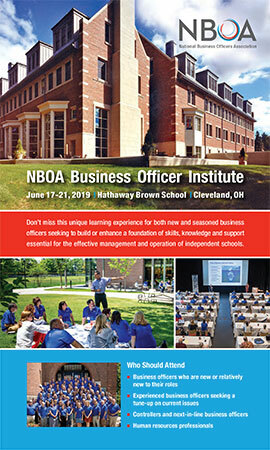 The 2019 Business Officer Institute will be held at Hathaway Brown School in Shaker Heights (Cleveland), Ohio on June 17-21. Registration will open soon. Check out details from the 2018 program below to give you an idea of what to expect. If you any questions, please contact programs@nboa.org. Registration for this program has reached capacity. If you have any questions, please contact programs@nboa.org. The NBOA Business Officer Institute provides the hands-on tools and resources you need to be successful at your school. You manage many areas every day—accounting and finance, human resources, facilities, business operations, board reporting and technology—and this program ensures that any business officer is up to date on the latest in those areas and the independent school industry. 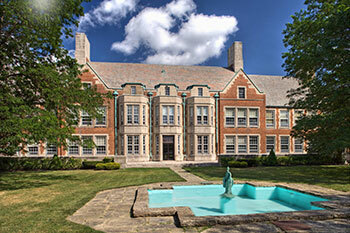 The 2019 program will be held at the Hathaway Brown School in Cleveland, OH and participants will stay off-campus at a hotel. All educational programs take place at Hathaway Brown, and several fun extracurricular events will be offered on and off campus. The program begins with a speaker and dinner on Monday, June 17th and officially concludes at noon on Friday, June 21st. The Business Officer Institute is created for and geared toward business officers who are new, or relatively new to their role and provides an immersion into the independent school world in a safe-to-learn environment. For those with more experience in the profession, the Business Officer Institute provides an opportunity to get a tune-up on the latest tools and resources available to help you do your job better. You’ll also gain insights into current issues facing business officers today in addition to serving as mentors to newer professionals. The Business Officer Institute is also valuable for other business office professionals to consider, including controllers, human resources or anyone aspiring to become the business officer of an independent school. This program offers a mix of general sessions as well as smaller, cohort learning, allowing you to make connections and get the most out of your week. Using a variety of learning experiences, the Business Officer Institute program offers a one-of-a-kind opportunity for new business officers to build a foundation of skills and knowledge to support you and your school. BOI’s intimate learning experience provides participants with opportunities to create long-term professional friendships with their peers. Past attendees attest that the relationships developed at BOI have proven invaluable to them over the course of their careers. This focused, intensive and energizing program allows you to concentrate on a variety of essential topics in a short amount of time. Courses are taught by experienced faculty comprised of experienced, highly-regarded business officers currently working in independent schools and facing the very issues you are as well as NBOA staff who are in-house experts on independent school business operations, some of whom have served as business officers as well. Other experts with industry-specific knowledge will lead seminars that focus on key aspects of independent schools. "This was the best conference I have ever attended. 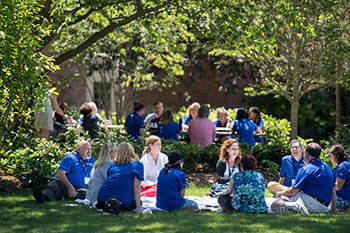 I enjoyed the close-knit relationships that developed over the week with the faculty, guest speakers and attendees. It was put together so well, I learned so much and left with a tremendous amount of knowledge to take back to my school. I highly recommend this conference to all new business officers!" "I found the Business Officer Institute to be very helpful. It should be mandatory for all new CFOs or business office managers."